Malala’s father, she notes, had an ironic curse: although he loved poetry and words, he had a horrible stutter that made it difficult for him to communicate. His stutter was worsened by the fact that his own father (Malala’s grandfather), Rohul Amin, had a beautiful, clear voice. Rohul was a popular theology teacher, widely praised for his electrifying speeches and sermons. Rohul took his son to get various treatments for his stutter, but none of them worked. Despite his speech impediment, Ziauddin attended the best schools in the valley, a luxury that didn’t extend to his sisters (Malala’s aunts). Growing up, Ziauddin was also fed better than his sisters. Ziaddun was able to listen to his father discuss politics and current events, as Rohul had met many of Pakistan’s greatest political leaders, including Mohammed Ali Jinnah, the founder of the country. In this section, Malala draws a sharp contrast between her own relationship with her father (loving, supportive) and her father’s relationship with his father (aggressive, intimidating). Despite the two men’s differences, Ziauddin clearly does become a good speaker and communicator, and passes on his father’s wisdom to Malala—Malala mentions Mohammed Ali Jinnah several more times, suggesting Rohul’s influence. Perhaps in part this is because Ziauddin eventually “works out” a good relationship with Rohul. Malala explains some of her country’s history. Pakistan has already amassed a long list of military coups, despite being founded fairly recently. When Malala’s father was only 8 years old, a general, Zia ul-Haq, seized power and executed the Prime Minister. The United States refused to send more foreign aid to Pakistan, since it saw Zia as a reprehensible dictator. Zia made life harder for women, weakening their rights in court and the political sphere. One result of this was that more women were raped, and their rapists were increasingly set free after trial. I Am Malala is a book about the life of its main character, but it’s also designed as a Westerner’s introduction to Pakistan. It’s assumed that the reader has little to no knowledge of Pakistan’s history, and so Malala gives a basic overview that would be redundant to a Pakistani reader. Malala wants to be a representative of her country, as well as a representative of human rights. In 1979, there was another major change in Pakistan: the Russians invaded Afghanistan. As a result, Afghanis fled into Pakistan, and General Zia allowed them to stay. Because of Russia’s actions, American befriended Pakistan once again, wanting to take sides against their Cold War enemy, the USSR. Zia cleverly manipulated public opinion to make it seem that he was bravely fighting against Soviet aggression, as well as supporting Muslim rights. Saudi Arabia sent Zia large sums of money, as did America. Osama bin Laden traveled to Pakistan to be a volunteer fighter on behalf of Zia. One of the major themes of the book is the relationship between the United States and Pakistan. Many American readers might not know about American involvement in Pakistan, and especially might not be aware that the US once supported Osama bin Laden and provided him with weapons. America likes to present itself as a benevolent force in the world, but from the perspective of many other countries—especially Pakistan, as we will see—it is essentially an imperialist power mostly concerned with protecting its economic interests. Zia and bin Laden certainly aren’t models for human rights, but the US supports them because they fight against the USSR. The Pashtuns don’t entirely accept the national border between Pakistan and Afghanistan, because they’ve traditionally been divided evenly across this border. One consequence of Zia’s rule in Pakistan, Malala believes, was that Muslims became more violent. Zia encouraged his followers to obey the law of jihad—the “struggle” for their religion. Malala adds that the CIA also encouraged Muslims to be violent, so that they would have eager allies in battle. Malala is surprisingly shrewd in the way she tells her story. Here, for instance, she implies that Pakistan’s recent outbreaks of violence and extremism are not an inherent part of Pakistani culture. On the contrary, they’re indicative of a recent change in the country—one influenced by the West, but which is now turned vehemently against the West. Because this is a relatively new phenomenon, Malala suggests, it can be un-learned. As a young man, Ziauddin gravitated towards the principle of jihad. He prayed for war between the Soviets and the Afghanis, so that he would have a chance to prove his bravery. Shortly after his “conversion” to jihad, Ziauddin met Faiz Mohammed, the brother of Tor Pekai, his future wife. Faiz Muhammed helped to convince Ziauddin to reconsider his desire for war and violence. As a young man, Ziauddin also dealt with bullying from his cousins, since he was short and dark-skinned—two qualities that were thought to symbolize mediocrity. The Ziauddin who appears in these flashback sections is nothing like the Ziauddin we see in Malala’s life: he’s warlike, angry, and eager to hurt other people. Part of Malala’s enthusiasm for politics and political reform, we may surmise, is based on her knowledge of Ziauddin: if Ziauddin is capable of changing himself so utterly, then perhaps Malala is capable of transforming others. As Ziauddin grew older, he learned to be calm, generous, and selfless, thanks largely to his friendship with Faiz Muhammed. When the wife of his former headmaster—a man who had tormented Ziauddin as a student—had an accident, Ziauddin bravely volunteered to donate his blood, saving the headmaster’s wife's life. Stunned, the headmaster apologized to Ziauddin for teasing him years before. Ziauddin also studied poetry and rhetoric, eventually earning his own father’s respect. Instead of practicing the familiar law of “an eye for an eye,” Ziauddin sacrifices his own health and well-being to help other people, even the people who have wronged him in the past. While these details in the book may seem like tangents to the story, they’re actually critical for understanding the way Malala looks at the universe. From a young age, she’s had an excellent role model. When Ziauddin was in his early twenties, he stunned his father by signing up for a public speaking competition. Although Rohul was skeptical of his son’s stutter, he wrote a speech for his son to deliver. Ziauddin practiced for weeks, and when he delivered the speech, it was a great success. Ziauddin was awarded the top prize. This, Ziauddin would often tell Malala, was the first thing he’d done that had made Rohul smile. Afterwards, Ziauddin entered many other rhetoric competitions, usually winning or earning a prize. Rohul became enormously proud of his son’s success. In honor of his rhetorical skills, Rohul nicknamed him “Ziauddin Shaheen,” which means “Ziauddin, the falcon.” Ziauddin politely refused this nickname, since a falcon is a "cruel bird." Ziauddin undergoes a number of transformations in this chapter: from a nervous young man into a confident adult; from an angry soldier to a calm pacifist, etc. Here, he transforms from a stuttering teenager to a mature, masterful speaker. By proving that he can speak to others, Ziauddin demonstrates his power as a politician and an educator. He passes on this passion for politics and education to Malala—it’s entirely possible that if Ziauddin hadn’t won his speaking competition, we wouldn’t be reading Malala’s book. Arn, Jackson. "I Am Malala Chapter 2: My Father the Falcon." LitCharts. LitCharts LLC, 2 Dec 2015. Web. 25 Apr 2019. Arn, Jackson. "I Am Malala Chapter 2: My Father the Falcon." LitCharts LLC, December 2, 2015. 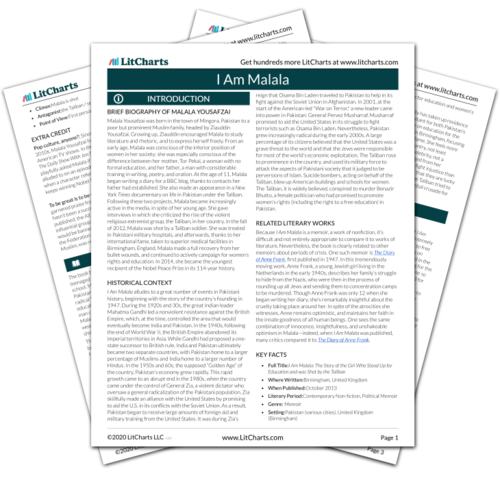 Retrieved April 25, 2019. https://www.litcharts.com/lit/i-am-malala/chapter-2-my-father-the-falcon.